I have never thought much of nectarines. I’ve always sort of thought that you could buy them, but why would you when peaches are sitting in the bins next to them? If I could get nectarines in February I’d be all over them, but in peach season? No thanks. Except, last week Jordan brought some home and I, thinking I should eat them quickly so I could fill up our fruit basket with peaches, brought them on a hike we went on. I know there was a certain amount of hunger and fatigue in the mix, but hot damn that was a good nectarine. So this summer, I’ve been buying them like they’re going on of style. I’ve been making ice tea with them, I’ve been sauteeing them with maple syrup and pouring it over French toast, and I’ve been making this salad. A simple simple fruit salad, but one that, while definitely sweet, has a savoury edge in the way I find sort of satisfying after spending a day making (and admittedly sampling) cakes. 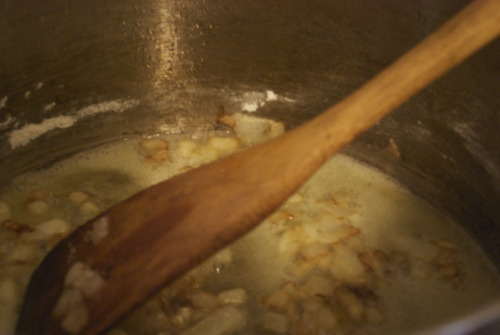 In a medium sized bowl mix together the vinegar, honey and oil. 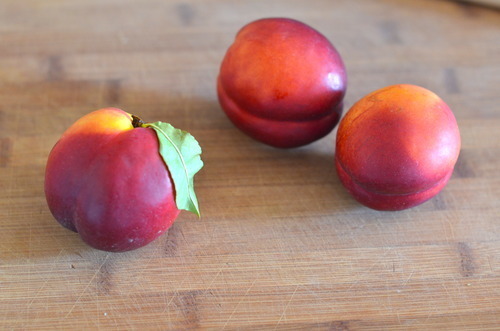 Cut the nectarines into slices (about 8-10 per fruit) and mix immediately into the vinaigrette so they don’t oxidize. 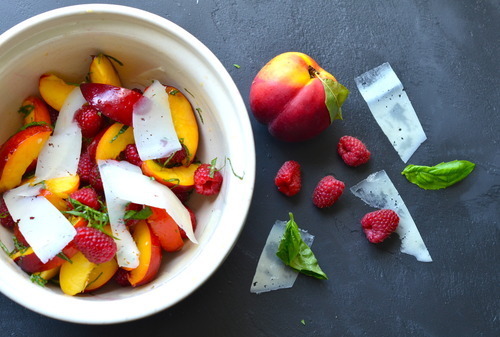 Mix them gently into the fruit, and then use a vegetable peeler to shave the cheese on top. This will last a couple hours at room temperature- if you can wait that long! It’s a funny thing, but in the winter time, I don’t really drink much. I don’t have much of a desire to. People always talk about glasses of red wine and books, and sometimes I agree with them, but mostly I drink tea. Or sometimes hot chocolate. That’s about as crazy as I get. Summertime though is different. It’s so hot out all the time, and I just always want a cold beer, or a crisp glass of white in my hand. Perhaps too much. Which is why, as I write this, I’m on a cleanse. Nothing crazy- just 5 days of no booze, no sugar, no flour and no caffeine. Oh, and no dairy. I’m just feeling like perhaps a bit of a reboot to the system might not be a bad idea. I think my body needs a recharge. However, on Friday, that will be done. And a long weekend full of long weekend parties will be waiting for me, and I think it will feel good to go into it with my body at full strength. You, however, should go into this weekend with one of these in your hands. These are Jordan’s creation, and a great one at that. They’re a play off a drink we had at a fabulous bar in Portland a few years ago- the simplest old fashioned with one little twist- the bourbon was infused with perfect summer cherries. 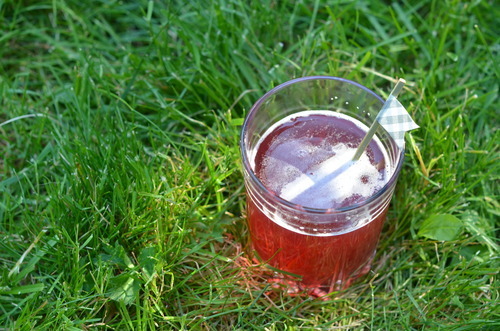 The result was a drink so well balanced and sweet without hardly any added sugar. It was a thing of beauty. So we started playing around with cherry infused bourbon a while back, and this is what we learnt- to do this the proper way, you need to infuse the bourbon for over a month. If you cheat a little and slowly warm the bourbon, while keeping it airtight, you can be drinking these tomorrow. This was one of the cocktails for Jordans parents big 40th wedding anniversary (lots of pictures to come from that soon! 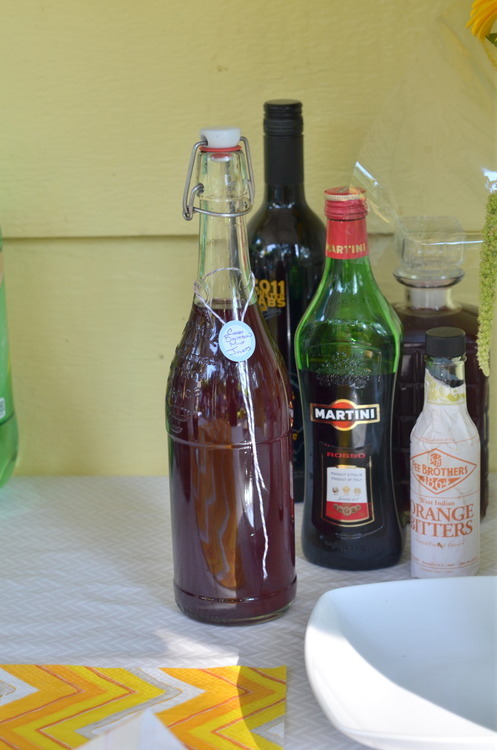 ), he played around with it and went away from the super boozy old fashioned into something a bit easier for most to sip- a mint julep with cherry infused bourbon. He also, being the clever man that he is, omitted the muddling step tradition to a julep and just made a mint simple syrup, but you can do it up proper if you prefer. Remove the stems from the cherries and wash them carefully. Split them into 2 1 litre mason jars. Pour the bourbon over top, filling until just under the lip. Close the jars and put them in the bottom of a large pot. Fill the pot up with water until just below the lids, and put the pot on a burner with medium heat. Slowly bring the pot to a simmer, let it stay, barely bubbling for 10 minutes, and then allow to cool in the water. The jars should seal. Wait until they are completely cooled before removing. Bring the sugar and water to a boil. Remove from the heat and put the mint in. Let steep for 20 minutes, and then remove. Transfer to a sealable container and store in the fridge. When everything is cooled you’re ready to make the drink! 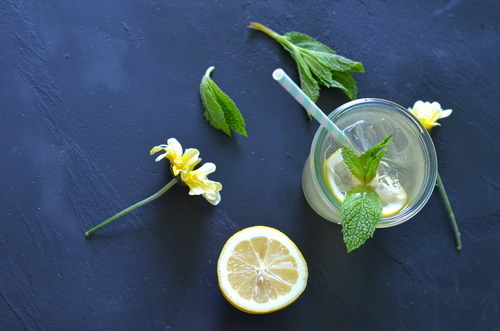 Stir together on ice and top with soda water! 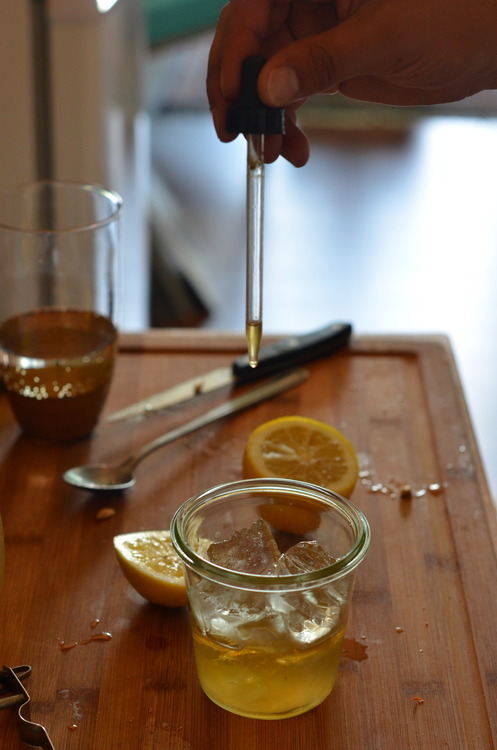 For the party Jordan made a big jar full of the bourbon, simple syrup and lemon combined, and people just poured it on ice and topped with soda themselves! 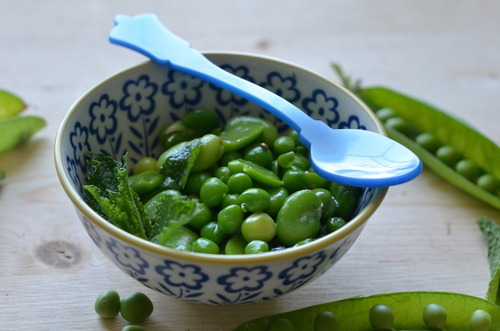 Today is a day for peas and fava beans. It is a day for bike rides, walks on the Seawall, and beers on patios. 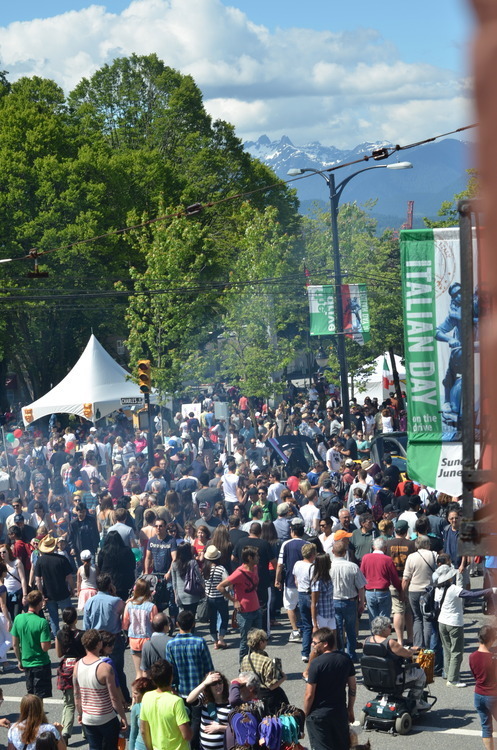 It is a day to celebrate, because it is 25 degrees out, there isn’t a cloud in the sky, and this must be the nicest Spring I remember since I moved to Vancouver over 6 years ago. 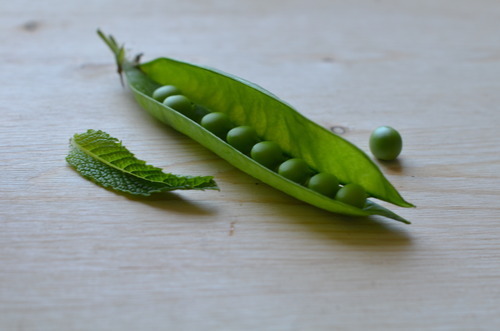 So today is a day for peas and fava beans. Normally I just cook them in a bit of butter and call it a day, but today I felt like I had to do something a little more special. 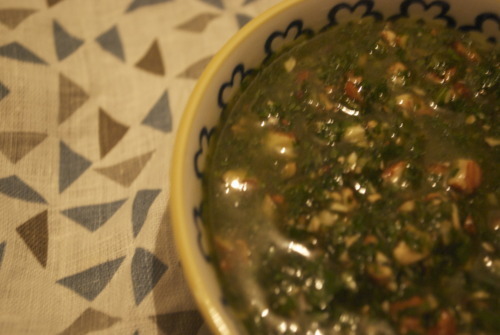 So I tossed in some mint, coriander seeds, garlic, and lemon zest and served it cold. 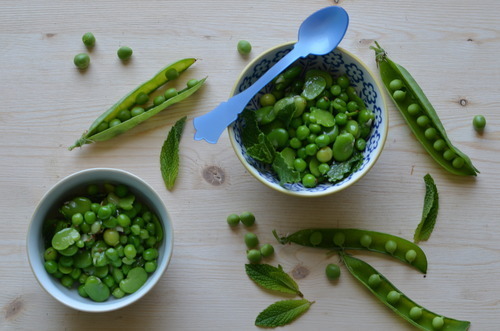 This is such a simple salad, and it completely relies on using really good quality ingredients- the freshest favas and peas you can find. I would love to say I picked them from my garden this morning, but sadly nothing lasts in this little apartment besides succulents, but I am spoiled rotten with my local market. 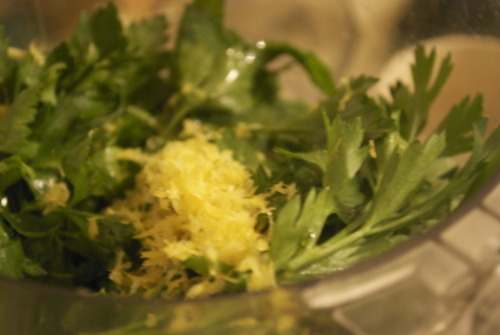 1 tsp Whole Coriander Seeds, gently crushed with the side of the knife. Bring a medium sized pot of water to a boil. Put in a good pinch of salt. Fill a medium sized bowl 3/4 full with ivery cold water. Blanch the fava beans in the boiling water for about 2 minutes. Scoop them out with a slotted spoon and immediately put them in the water. Stir them around for a couple minutes. Remove the favas from the ice water and remove the hulls- pinch off the white outer layer from the beans and discard it. Blanch the peas in the exact same way- 2 minutes in teh boiling water and then straight into the water. In a small frying pan warm the olive oil over medium heat. 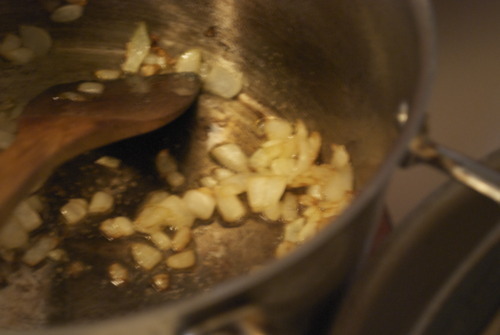 Put in the garlic and stir until it is aromatic. Toss in the coriander and cook for another 30 seconds, being sure not to let the garlic burn. Pour over the favas and peas. Mix in the zest, half the lemon juice and the salt and pepper. Tear the mint apart and toss it in as well! Summer salads are an easy seduction. The bright colours, the delicate greens, the warmth of fruit warming in the sun, it’s a simple formula, like the blonde with the big laugh on TV, there is something comforting about getting it all upfront. 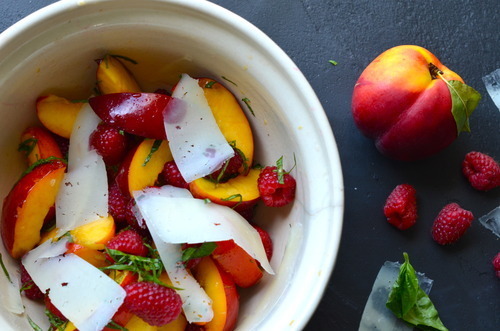 There isn’t much hidden in a summer salad. Winter salads are the opposite. Either there is nothing at all to love, you know the ones, with the flavourless lettuce, the watery cucumber and the grainy tomato, or you take some time to produce complicated mix of things that use up the limited things that grow in January. 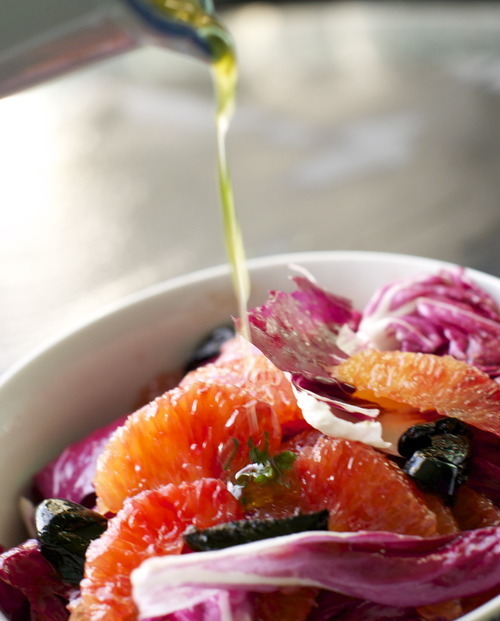 This salad falls firmly into the latter category, it’s a perfect balance of bitter lettuce, salty olives, and tart oranges all tossed in a sweet dressing that is brightened by fresh mint. 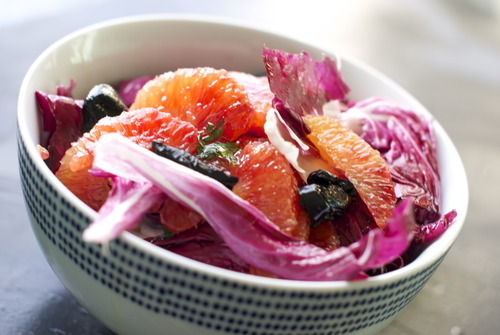 I started thinking about radiccio at home, but when I got to my local market and saw the blood oranges I couldn’t resist adding them to the mix. It wasn’t until I saw the mint perched close to the check-out that I realized that this salad was teatering somewhere between Italian and Moroccan. Regardless of it’s origins, this salad and a thick cut of toast is the answer to a cold crisp day. Segment the oranges: Cut off their tops and bottoms. With the orange “standing up” cut off the peel and pith so that no white from the peel remains. Over a medium bowl pick up the orange and using a paring knife cut in between the membranes to release each slice of orange. When your finished removing the slices squeeze all the remaining juice from the core into the bowl. Repeat with the rest of the oranges. Strain the orange slices into a small pot, and reduce that liquid until it is syrupy, and only about a tablespoon remains. Mix this mixture with the lemon juice and whisk in the oil. Add a pinch of salt and adjust the seasoning as you wish. Mix in the parsley and mint. Wash the radiccio and tear into a big pieces. Mix them with the orange segments. Tear the olives apart by pressing your thumb into the middle until the olive splits in half. Remove the pit and tear them fully in half. 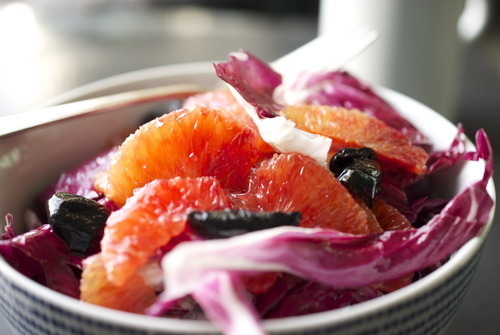 Continue with the rest of them and add that to the bowl with the orange and radiccio. Toss with the dressing and serve immediately! I’m sick. I’m sick and I feel dreadful. I’m sick and all I want is my moms chicken noodle soup because hers always tastes better then mine no matter how much I do it exactly the same way. I’m sick and I’m cranky. I’m sick and I need something comforting that takes very little work to produce, and also very little money because I can’t work when I’m sick, and though I dream of paid sick days they are certainly not in my immediate future. Did I mention I’m sick? And that I’m cranky? 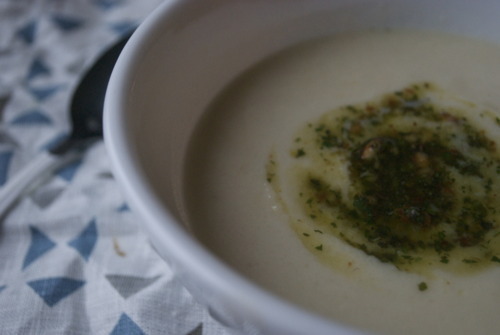 So I made cauliflower soup. It’s so simple and takes minutes to make and its so creamy and rich without having any dairy in it (bad for my throat) or being heavy (tough on my stomach). It’s a wonderful, wonderful soup that lends itself to all sorts of things, and in this case it is a perfect backdrop for a mint-almond pesto that makes everything seem just a little bit brighter. Which is a very good thing when your sick and cranky and it’s raining out. Did I mention that it’s raining out? 2 Heads of Cauliflower, cut up into big chunks. Add in the onion and cook until it’s translucent, about 5 minutes. Add in the garlic and cook another minute until the garlic just gets fragrant but doesn’t colour. Add the flour and mix well so that it forms a loose paste. Stir for 2 minutes to cook out the flour. Add in the stock and give it a quick stir, then add in the cauliflower. The florets should be barely covered, if they aren’t add a little water or more stock. 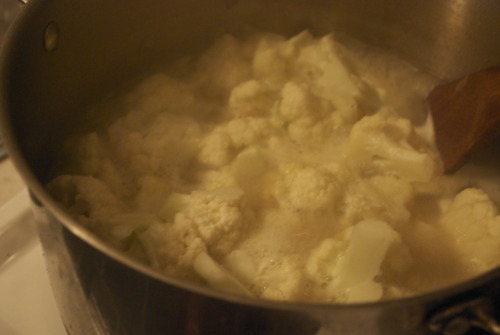 Put in a good pinch of salt and let that simmer until the cauliflower is cooked, about 15 minutes. Puree in a food processor or blender until smooth, and then rewarm on medium heat. Add the lemon juice just before serving. Spread the almonds onto a pan in a single layer and put them in the oven for about 10 minutes, turning them once or twice to toast them. 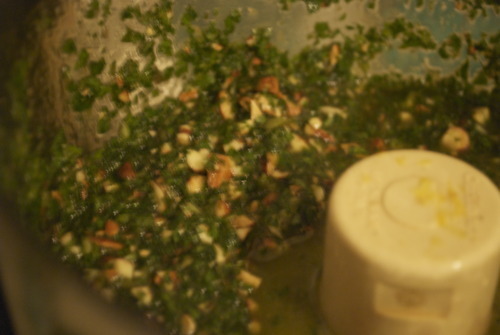 In a food processor put the mint, parsley, garlic, zest and chili and pulse three or four times, just to break up the leaves. Add in the Almonds and pulse again to break them up. Taste and check your seasoning and then pulse again until a nice loose consistency is achieved. Then eat this soup curled up in a ball in front of your computer while you watch Mad Men reruns. And you will return to health.